With the Prott Viewer you can seamlessly preview and comment on prototypes that have been made with Prott. No need to create an account. Easily store as many prototypes as you want and preview them offline, anytime, anywhere. Prott Viewer for Android or instantly preview and comment without installing the app using Prott Viewer for Android's Instant app. 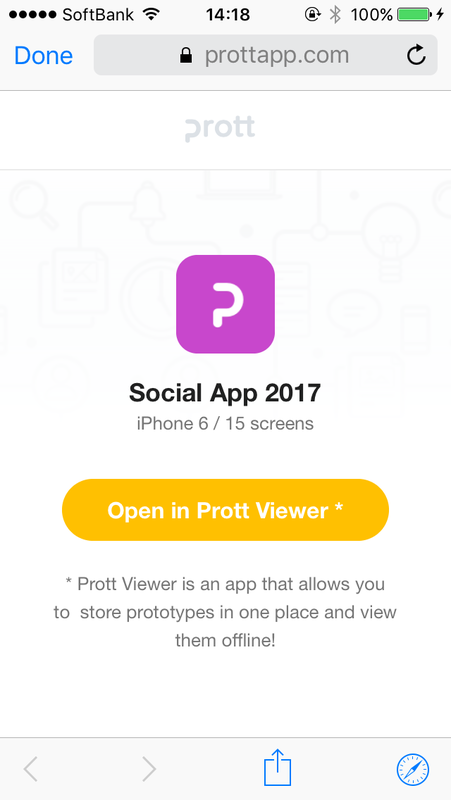 Note: To be able to create and edit your own prototypes from your mobile device, download the Prott for iOS or Prott for Android (sign-up required). Tap the preview URL that's been shared with you. The browser will open. Tap the Open in Prott Viewer * button. Once the prototype has finished loading, tap the preview button to begin previewing! Tap on the following sample preview URL https://prottapp.com/p/8c6815 to see what it's like in the Prott Viewer app!